Beginners and those returning to skating after a long time may not always want to invest in costly skates. In this regard, young girls and women can learn roller skating or can resume honing their skills on the four wheels without breaking the bank. At the same time, it is imperative that the skates be of good quality lest they cause beginners to make mistakes and even hurt themselves. Come 2018, we will have some amazing models of cheap outdoor roller skates for women which can combine the best of features, price and reliability. This Speedy Roller Skate has classic durable features like comfort high top fit boot, solid heel support, easy lacing system, sleek styling and ankle support straps which makes it soft and pliable for women’s feet. It is completely safe as it causes less vibration and interference from the ground due to its 54MM urethane wheels and wide suspension skate truck which roll over cracks and bumps with balance and prevents injuries. On the other hand, the single action truck and durable action precision bearings provide better control and grip for a smooth and speedy rolling experience. It is available in all sizes and in three colors with six variants, making it an ideal competitor for the sub-$50 segment. 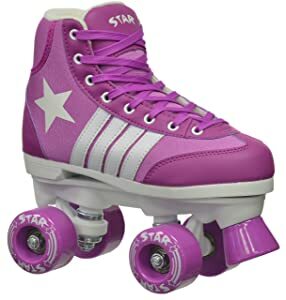 The second challenger of this range is the Epic star Pegasus Purple Quad roller skates which have sneakers with 2 pair of laces (Purple & white). What makes it more comfortable is its padded collars and high-top shoe style for increased ankle support of young girls. It’s absolutely safe for all skaters courtesy its nylon plates, double action trucks, indoor/outdoor polyurethane wheels, Abec 5 precision speed bearings and toe stops for preventing accidents on roads. It is available in pink color, all size ranges and is priced below $70. Folks with slightly heavier wallets and/or ones seeking a speed boost can go for the second Epic contender in this list -= the Super Nitro. It’s both comfortable and reliable for the women skaters with black and silver trim boots, padded collars, adjustable speed straps and ABEC-5 8mm precision speed bearings. Its nylon plates with double action trucks prove that the company is serious about the safety of the skaters. 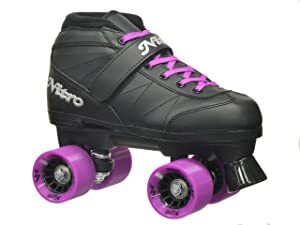 It comes with purple with Black hubs, which are coupled with indoor/outdoor polyurethane wheels and 2 pair of laces (purple & Black), the latter adding to its oomph quotient. 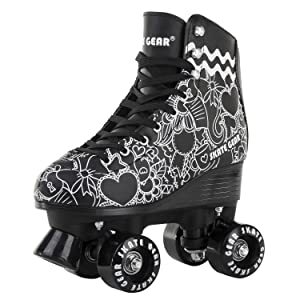 Those seeking ankle-length roller skates must try Chicago Women’s Classic Roller Skates because its top profile rink pattern white leather boots are capable of supporting the impressionable ankles of teenage girls. It has an easy lacing system which includes eyelets and speed hooks to adjust the fit as one starts moving. It can be doubly adjusted with aluminum base plate truck and chassis, jump bar and 5/8” toe stop for easy controls and turnovers. Added to this, it has durable vinyl 60mm Urethane spoke core wheels with 608Z semi precision speed bearings which together provide great traction in order to improve maneuverability and prevent injury. Considered along with its excellent price point, these features make this Chicago contender a premium product that beginners can truly afford. Thus, the above range of roller skates is not only pocket-friendly but also keep in mind of the latest fashion trends among young women. Added to this, they take care about the security and comfort quotient when it comes to teenage girls who may be skating for the first time. So, skaters at the novice or intermediate level can choose any one according to their choice and style statement without worrying about injuries or incorrect posture/adjustments.